This french navy linen shirt is perfect for laid-back summer days. 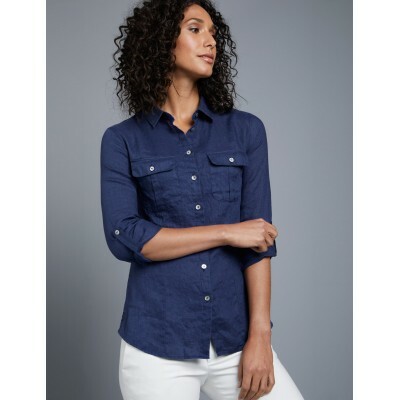 Featuring a relaxed fit, two chest pockets and a soft pointed collar, this shirt effortlessly combines style with comfort. Finer details include mother of pearl buttons and fasten tabs so you can roll up the sleeves. Classic fit non-iron poplin blue shirt.. Designed with the modern man in mind, this navy stretch shirt has been specially engineered to flatter your physique whilst maximising comfort. Crafted from luxe combed cotton fabric with added stretch, this high-performance shirt allows full freedom of movement. The slim fit is gently tapered acros..
Мужская приталенная рубашка, тёмно-синяя в крупную белую клетку, манжеты на пуговицах и полусрезанный воротник. Выполнена из 100% хлопка. ..